As I’ve mentioned in my Chicken Tractor Guide, you can use the chicken tractor design for layers. 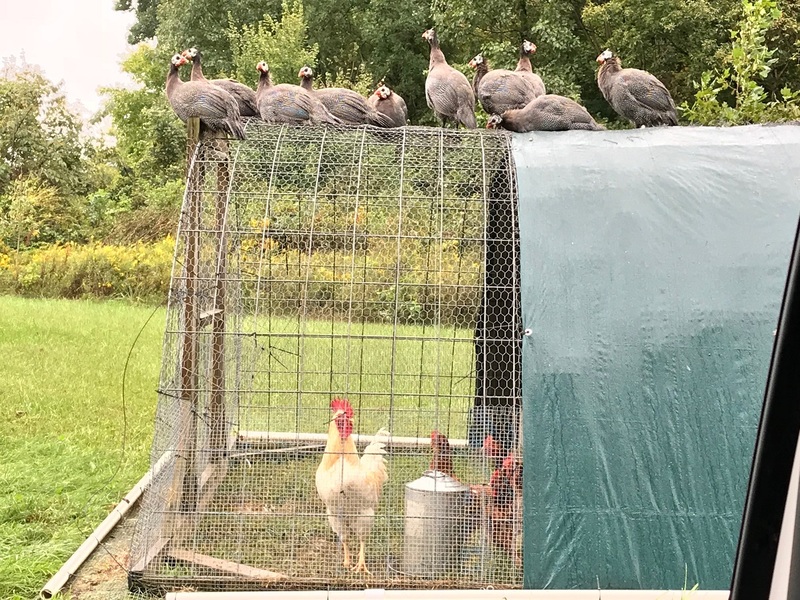 So this summer and fall we’ve used our idle chicken tractors to house the new flock of layers while the old layers are in the A-frame coop and being phasing out. Since this was temporary, I did not fasten the layer box to the back wall, but you could easily make a light weight set of 2-3 boxes to hang off the back wall. Instead we used a double box I made out of scrap 2x wood for another project. It’s heavy but works good. Optimal moving depends on the stocking density. For our 8 birds I’d say about every 3-5 days. We’ve gone as longer during busy spells, leaving the ground looking like a post-apocalyptic movie scene. I reconciled staying in one place so long with the fact that using good feed and the pasture has plenty of time to recover before next year. Their foraging area is much smaller than the A-frame; however, that can be mitigated with more frequent moving. Also, I’ve already experienced that this lighter breed can fly over the chicken wire fence we use for the A-frame. A final note. This ISA Brown flock really dug into the soil much more than my previous breeds leaving many deep holes when we removed the tractor. I say deep, but the deepest was about 4-5 inches. They seem to digging shallower holes as time passed, which may be a factor of us moving them more frequently or just age. Since we have roosting poles already in our tractors, we only had one real issue, the tarps. 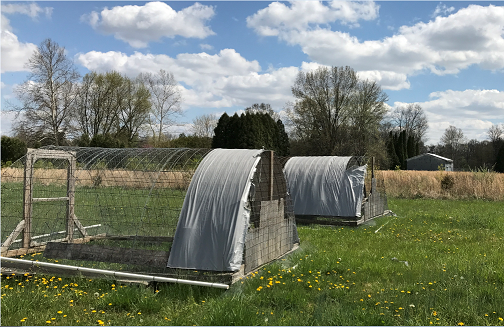 The tarps are medium duty and will typically last until the fall, sometimes longer, unless you have birds resting on them as we do. Last year it was the crows that tore up the tarps. This year it’s our flock of Guinea fowl. Check out what a week of roosting can do to a tarp. Fortunately I had an old piece of roofing laying around that I could attach to the top. The boys just held some scrap pieces of wood on the inside of the coop that I fasten the roof to with screws. This will protect the tarp and ensure a dry area underneath for the food dispensers. October came and I decided not to move the chickens to the A-frame. A chicken escaped the tractor during feeding and we caught her that night perched on the fence that keeps my Rainbow flock contained around the A-frame. It’s really nice having them in the tractor, not needing to open and shut the coop each day and not worrying about them flying over the fence or aerial predation. The cold of winter is my biggest concern. I would want some better protection than the tarp and windbreak. These are hearty birds and I’m think I could design a suitable shelter area in the tractor; however, snow is problematic for moving and requires some more thought. 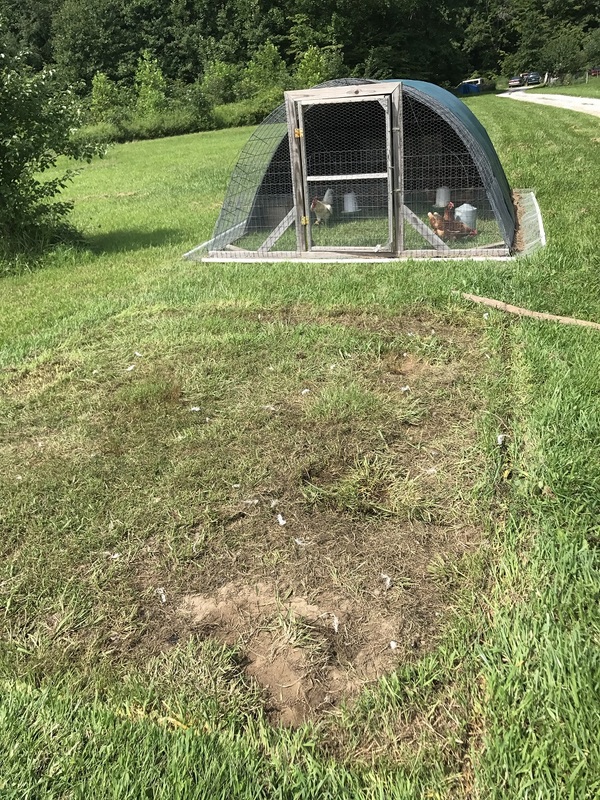 This experiment got me thinking about building a new chicken coup on a trailer frame and incorporating the best feathers of the A-frame, chicken tractor, and more. Something very portable, versatile, and low maintenance. Keep an eye out for the results of my new coop idea. I’ll add a link to the new post here when it’s ready. Until then, here’s a teaser. These are the comments I hear most when it comes to buying a whole chicken. I’ve been making meals with whole chickens from our land for a few years now and this is what I’ve come to realize. I don’t have time to roast a chicken either. And knives, chickens, and myself should never be within proximity of each other at the same time. 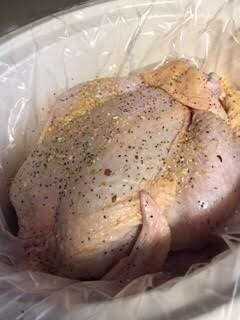 HOWEVER, regarding the last question, I do know what I do with a whole chicken and thought I would share my no-time, no-fuss method of getting the max out of a chicken. Grab a crock-pot, a few staple kitchen ingredients, and you are ready to go. 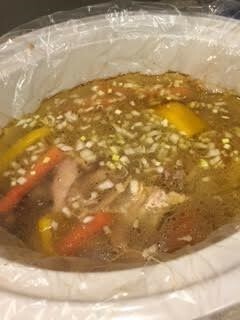 After thawing out the chicken in the fridge for a couple of days I place it in a crock-pot. Sprinkle it generously with salt, pepper, and garlic. You can add other seasoning if you want. This is just my basic, take 5 minutes, and get the bird slow-cooking. Cook on low for 6 – 8 hours or high 4 – 5 hours. As with all food prep, times may vary depending on the size of your bird, crock-pot, etc. Basic rule is an internal temp of 165 degrees and juices run clear. Once the chicken is cooked I take it out of the crock-pot and let it cool down for 30 or so minutes. When it is cooled down enough to handle without burning your finger tips, it’s time to pick apart the meat. I’m sure there are plenty of YouTube videos that showcase the how-to’s and ways to pick apart a chicken efficiently. Watch a couple, get the feel for it, wash your hands, and start pulling! This process only takes a few minutes once you get the hang of it. After the chicken meat is pulled off I cut it up and divide it into 2 cup quantities. You now have the base for a multitude of recipes; chicken salad, enchiladas, soups, casseroles, and the list goes on…. Now comes the next step. 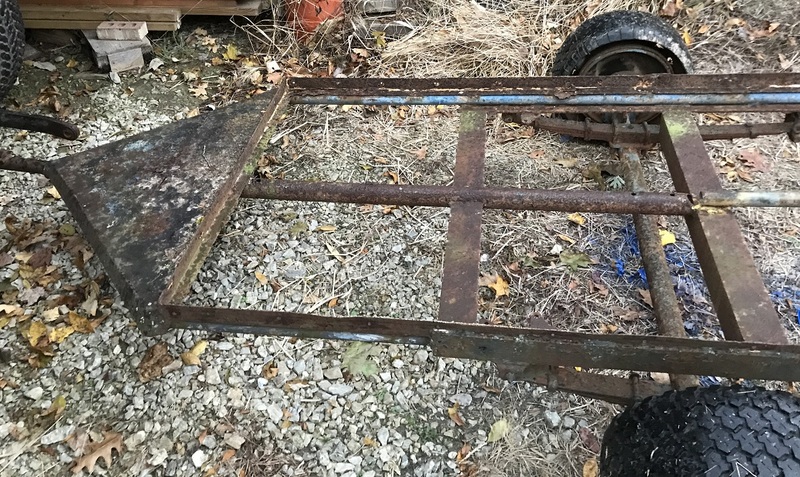 What to do with the frame and chicken leftovers after pulling the meat off? Chicken stock, of course! Using the same crock-pot (keep the juices from the chicken) return the chicken remnants. At this time I add whatever vegetables I have on hand that don’t have much shelf life left. Onions, garlic, carrots, celery, and bell peppers are my usual. Sometimes all and sometimes none. It’s not an exact science and you can wing it. A splash of cider vinegar, a couple of bay leaves, add water to cover plus about an inch or two higher, and you are good to go. Cook on low for 8 – 10 hours. If life gets busy and you forget and it cooks longer, no biggie, the longer you cook it the more nutrients you will get from the bones. Good stuff. Once your stock is done, strain it through a cheese cloth and marvel at the nutritional liquid gold you have at your disposal. Note: Coloring will vary from a yellow to a darker brown and is dependent on time cooked and vegetables used. The final step is to use and/or freeze your bounty. I usually place everything in the fridge and use it, as needed, for a couple of days. Then I divide out what I have left and freeze for future use. 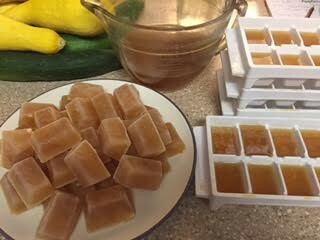 For the chicken stock I pour into ice-cube trays, freeze, and pop them out. 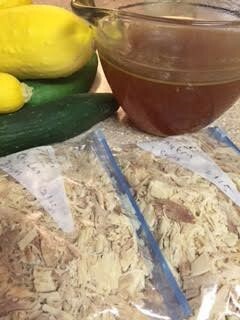 Store them in a gallon zip lock bag and you now have grab and go chicken stock. I use these for just about anything that requires water. Rice, sautés, soups, etc. And that, folks, is what I do with my whole chicken. 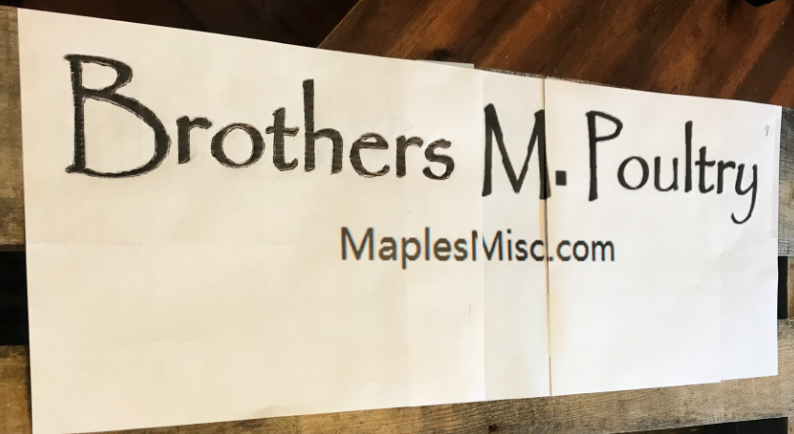 Brothers M. Mondays – A new post each Monday until the 2018 market season starts on 5/26. We are family. Samantha fractured her ankle, but the chickens don’t care if you’re sick or hurt, they still need care multiple times a day. So family kicks in. Dad, Joseph and even a cousin or two have been helping Matthew while he’s the lone wolf. Since Samantha couldn’t help, we put her to work taking some video. And the youngest did her part by taking a few pictures and an unintentional video of Sam and the boys with her new camera she got for her birthday. Enjoy the video we’ve put together. Pasturing is an important part of producing such high quality, good tasking chicken. 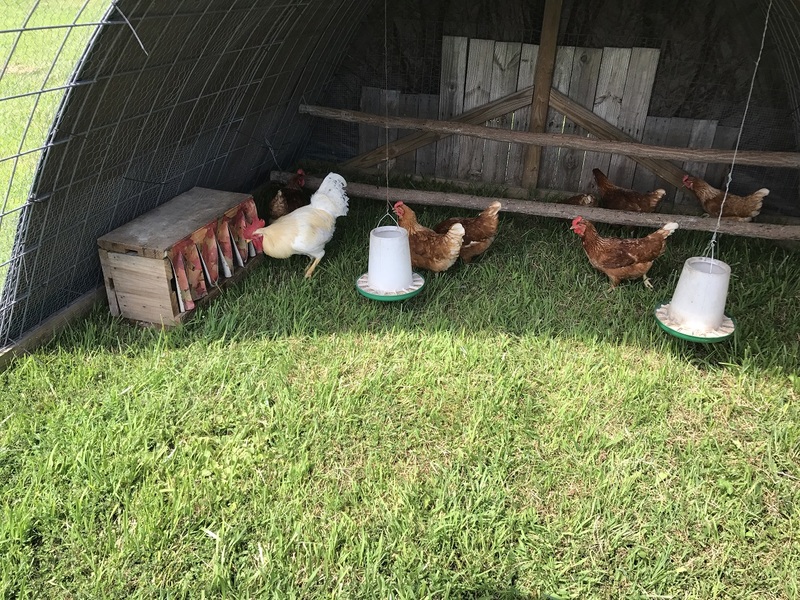 We get them onto pasture as early is safe for the chickens to maximize their naturally grown experience. Enjoy the video of the kids moving the chickens from the brooder into the pasture. 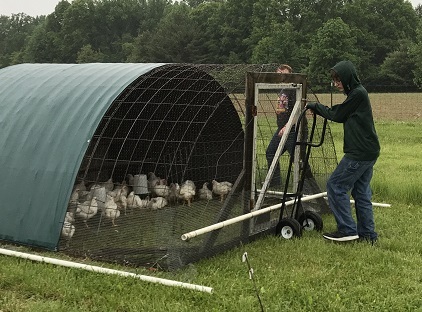 Each year the chicken tractor tarps need to be replaced. These are an important part of the tractor providing shelter from rain and storms as well as shade. Therefore they need to be in good shape each year. We needed new signs for the farmers markets. Samantha offered her talents to help with the creation. She likes painting and does a good job, so filling in the tracing lines was a snap for her. The signs are made of recycled pallet wood. They feature a rope handle and space in the middle to carry most of our farmers market materials. We used a home made carbon paper method to transfer the outline to the boards for painting. Basically cover the back side with pencil graphite then traced real hard. Don’t forget our CSA is still open, check it out. The chickens have arrived and are safe and sound in the brooders. The newest partner did just fine handling and preparing for the chicks. Check out our CSA after you enjoy the video.